So, I've been wondering -- who buys those taquitos that they sell in the frozen foods section of the grocery store? And -- are they actually good? And also -- why don't people just make them at home? They're really not difficult to construct. They take minutes to cook. And, contrary to popular believe, they don't require a deep fryer to get that uber crispy delicious exterior. Now, we should disclose that we really hate cookbook claims that healthier versions of traditionally unhealthy foods taste just as good as their fat-laden counterparts, in part because it’s almost never true. Fortunately, we found at least one instance where the baked version is just as good as fried, and maybe even better. 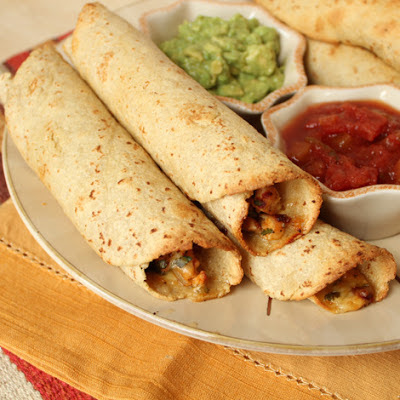 These deliciously smoky chicken taquitos bake up crispy and delicious thanks to a brush of melted butter and some time in a hot oven. 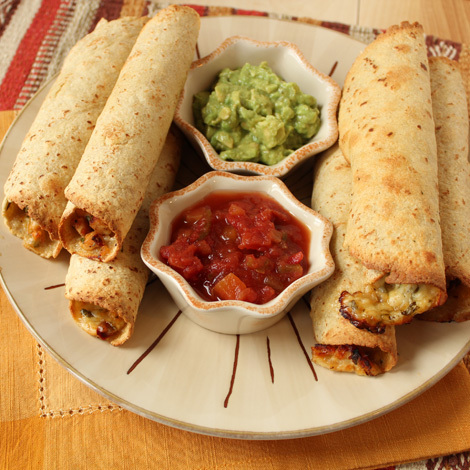 They’re the perfect snack for game day, or any time you’re craving that fast Tex-Mex food fix.